The one thing that seems to be missing in Weston at the moment is a regular big disco for those who remember the good old days when going out on the weekend. The clubs of old are no more and the music we all knew and loved seems to be only played at one off events that are springing up once in a while. 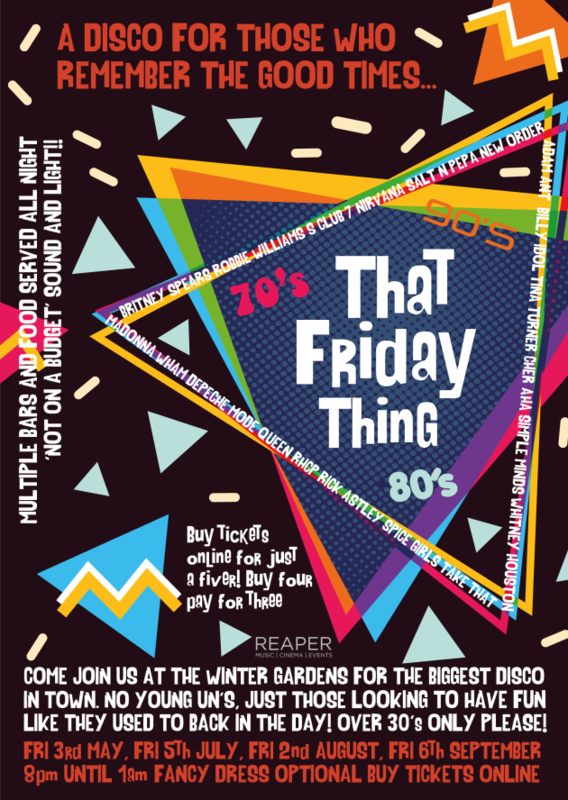 The Winter Gardens has now played host to some great live music and cinema events and we thought why not host a disco where all the music from the 70's to 90's was played for people of a certain age group without the aggro in a safe and awesome venue with a huge PA and impressive light show. Come and chill out with plenty of seating and space to spread out, a great dance floor, food available all night and plenty of bars to keep you topped up with drinks. For only £5.00 this will give you a ticket for entry, On the Door will be £10.00 so makes it worthwhile to buy up front. If you buy the saver ticket this will give you access to all four this Summer but you'll only pay for three. If we get a lot of support for this we'll start putting more on and maybe theming each one with a specific decade. Let's make this the place to go and enjoy ourselves without worrying about a thing (except that it's Friday and the weekend is here)! !